How do you define an envelope? Well, it is a packaging item made of flat paper with a sealable flap used to wrap or enclose letters, cards and documents. Letter writing may well be a thing of the past with emails taking precedence over hand written letters, but hard copies are still needed and the importance of envelopes is when those letters are to be handed over to someone. To whom should the letter be handed over to? All these are answered by the envelope. And at the other end when a person receives the letter, he comes to know through the envelope of the person who has posted him the mail. The envelope not only functions as a packaging item, but it also bears the address of the receiver as well as the sender. Envelopes help in delivering the contents inside safely and securely to the correct addressed person. This is of utmost importance, right? Envelopes were first used in the Middle-east and as a matter of fact, it wasn’t made of paper nor did the envelopes enclose letters. It was used for private financial transaction and the material used was clay. It was used to wrap the financial tokens and dated back to around 3500 BC to 3200BC. Around in the second century BC, paper envelopes were invented in China and named as chih poh, they were used to store money gifts. In 1845, the first machine made envelopes were produced by the British duo of Edwin Hill and Warren De La Rue. The sheets had to be precut and were then fed to the Hill/De La Rue machine. The machine would just make the sheets ready for folding by applying the crease. The wax sealing needed to bind together the flaps was manually done. Almost 50 years later, a commercial machine for envelopes where the envelopes would be pre-gummed in the machines itself was developed. Then at the end of the 20th century, the U.S Postal Service started the system of delivering a digital frank or stamp via internet to small businesses who would then print this stamp on their envelopes using a printer. This had the advantage that business establishments could now customize the design on the envelopes as they desired. That sounds quite interesting, isn’t it? Have you noticed that envelopes now come in all sizes and there isn’t something like a fixed size or style for it? You can get as creative as you like for the envelope layout when you need to advertise your products or services. You have three types, the pocket, wallet and the banker envelopes. Just think of greeting card envelopes. They have the three overlapping ends glued together and an open triangular fourth flap. Get the picture of booklet envelopes in mind. These have a curved or trapezium shaped flap at the top. Here the opening flap is on the short side. Haven’t you seen the common envelopes for inserting paychecks or appointment letters? Agreed, envelope styles, sizes and functions have all evolved over the years, but there is a format to write on the cover of the envelope, isn’t it? You cannot just write haphazardly on the envelope and expect that it will be delivered to the right person. The postal service needs to understand to whom it is to be delivered if you have posted it. So always write it clearly and boldly so that it can be easily read by the postman. And an added advantage is that you can let out your creative side by making use of calligraphy to beautifully write the addresses on the envelope. Well, what a way to impress the receiver with your creativity, isn’t it? 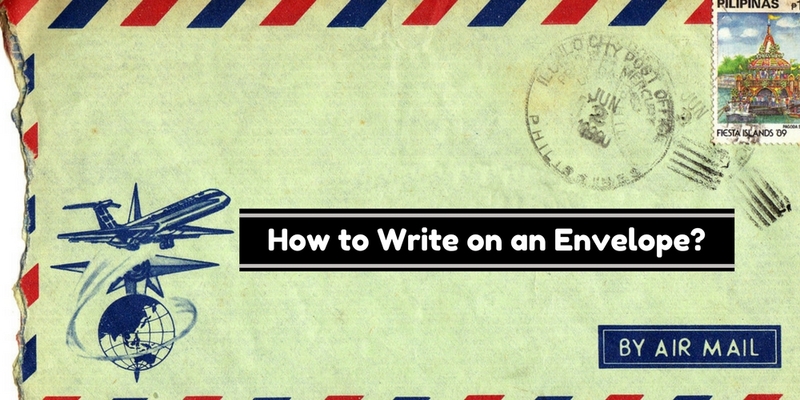 How to Write an Envelope? 2. The sender’s address or the return address. 3. The postage stamp, if the letter is to be posted. Even the address needs a correct format. You start off with the receiver’s full name first. The next, c/o is optional. It has the name of the person who can receive the mail if the addressee is not present when the mail is delivered. Next, we start with the address, and foremost in the address comes the street number and the street name. You can use proper abbreviations if required, like ‘ave’ for avenue or ‘st’ for street. Then the next line has to be for the city, state and the zip code. Next which is optional is the country name if you are mailing it to another country. The addressee may be an individual working for the organization or to the organization itself. When you need to address it to an individual, write his full name on the first line. Write his designation or post on the next line. Write the full name of the organization in the third line. You can start from here if you are addressing it to the company. Follow it up with the address of the organization as mentioned above. That means the street address comes first in the address part. Finally write the city, state and zip code. After you are done with the receiver’s address, the next step is the sender’s address or the return address. This is written at the top left corner of the envelope. The sender’s name is not compulsory but the full address is necessary to be written as mentioned above. So what is the use of writing the return address? Is it that the receiver comes to know who has written it? Of course, it serves that purpose. But it is not for that intention that you need to mention the return address. The concept of return address was started by the US postal service back in 1880’s. This return address helps the postal service in returning back the letter to the sender when it cannot be delivered to the addressee. There might be other factors like postage due, invalid address or damage to the mail, in which case the postal service returns back the correspondence. The invalid posts or the dead letter mail ends up in the dead letter office. But when the return address is mentioned they are sent back to the address. Usually the reason why it is delivered back is written on the envelope. This helps the sender to know the reason why exactly the letter has returned back. Ah, how can anyone forget the stamps which would be collected as a hobby? But what purpose does the postage stamp serve on an envelope? It is the proof that you have paid for the postal services. Earlier the postal services were to be paid by the receiver. But problems arose when the postal service was not able to collect their dues from the receiver. To resolve this issue, stamps were introduced and the postal service benefitted a lot from this. Sometimes instead of the stamp being glued on the envelope, you have the embossed stamp on the envelope itself and the price is included when you purchase the envelope. The stamp is cancelled or postmarked by the postal department so that it cannot be reused again. Remember that an envelope need not necessarily be posted. It can be hand delivered personally too. If it is your paycheck or appointment letter, then it is wrapped in an envelope and personally handed over to you. Even in institutions like hospitals and colleges, documents are always enclosed in envelopes. Gift coupon, in the same way is given to the person after it is enclosed in an envelope. If you ponder a while on where an envelope is used, you get to collect so many instances when it is useful. And also note that the type of envelope used varies based on its functionality. It may be a business envelope or a personal one. Be it for commercial use or personal purpose, the size and look of the envelopes vary. These are used for carrying important documents and are designed to be tamper-proof. The interiors of these envelopes contain pattern which tints the content inside and makes it hard for anyone trying hard to decipher the contents of the letter from outside. So confidential documents can be parceled through such envelopes. These are the beautiful ones among the lot, isn’t it? Invitation envelopes, as the name suggests are used for greeting cards, invitations and note cards. Have you ever seen envelopes inside envelopes? Yes, it is used when you need to fill in details and mail it back to the company. Such envelopes are provided by the company itself with the address already printed on it and the cost of stamp is also borne by the company. This is the remittance envelope. These are the business envelopes and are widely used for correspondence by organizations and offices. These are heavily gummed to hold bulky books and catalogs. These have a window cut on the front side secured with transparent plastic. The name and address is visible from the window. Though these are not so secure, but it is still popular since it eliminates the need to separately write the address on the envelope. Apart from this, we do have the CD envelopes, office envelopes, small envelopes, fancy envelopes and the customized envelopes. Well, isn’t that a wide range of envelopes to choose from depending on your purpose? Now, if you want to know about the size of the envelopes, then know that there are various sizes depending on the length of the letter or document which is to be inserted inside. These are used for heavier content like catalogues and brochures. These are the A series envelopes and are used for personal purposes. Used for enclosing books, thick stacks of paper or heavy catalogues and come with a flap on the long side of the envelope. These have pointed flap and are used for commercial and social applications. As the name suggests, these are square envelopes used both for commercial and personal purposes. You already got an idea about the uses of envelopes from the types of envelopes that you read just above, isn’t it? Envelopes have varied uses be it commercial, office or personal. Uses in commercial applications include that for mailing annual reports, brochures, general body meetings or documents and letters related to the firm. Window envelopes are usually used for posting dividends and interest checks to the investors. Office uses are like mailing or handing over paychecks, invoices, pay receipts, reports, brochures, insurance policies and appointment letters. Window envelopes and the pockets are of common use here. Invitation uses maybe personal or commercial. It can be used for greetings, well wishes or for congratulatory cards. Advertising purpose includes posting of brochures, event invitations, booklets or pamphlets to advertise your services and products. Envelopes may be used to simply have personal correspondence between two individuals or between firms and institutes. Envelopes are just papers used for wrapping the letters, wasn’t that the definition given above? After reading so much regarding envelopes you must be aware of its importance, right? So now that you know the importance of envelopes, whenever you need to write the address on an envelope, write it clearly and in the correct format.